Considering I have been diagnosed with an incurable disease like Crohn’s, I feel I have every right to be upset, and to be upset often, if that’s how I decide to cope with my issues. If you were put in my shoes sometimes, you would be troubled too. I am struggling with this incurable issue, a poor prognosis from medical doctors, something not easily fixable. But to the outside world, I can come off bitter or derisive. I have every right to be angry about my issues, because they are a major ordeal to me, lest you forget they are mine to deal with. But to you, I’m needy and negative. These diseases and illnesses don’t just happen, they happen to you and to your family – you do not get a choice. 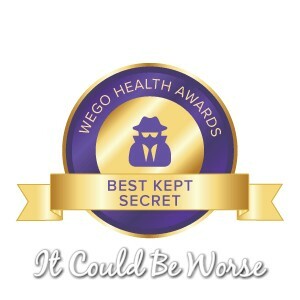 Feeling bad, fatigue, night sweats, headaches, skin sores, joint pain, vomiting, stomach cramps, insomnia, and overall bowel ISSUES, are the worst. But try dealing with them for 2+ years, stressing and worrying, living everyday dwelling about these issues. My body hurts and my mind gets tired. I look at myself in the mirror and I find problems that weren’t there the day before. I look at my Crohn’s body, trying to see if there are any visible signs of my illness, for sores, for pain, for bruises. I live in my bathroom most days. I try to keep up with my problems and symptoms, because I know it’ll up and vanish on the day of my appointment, go figure. Most days I won’t even eat until dinner, I haven’t been able to keep that down lately, usually because my stomach just feels wrong. I have to worry about having issues in public, at any given time. I want to not be embarrassed to show my face or skin, and I want to be able to feel ‘well’. To some, staying at home and not working would be an ideal lifestyle, but some have no idea what I am dealing with every day. These issues are a big deal to my family and my future, and they can lead to even more problems, like more emergency surgeries or hospital stays. But to you, I’m just angry and dramatic. Truthfulness about my disease is not negativity. Imagine your life with an ailment or illness of any kind. Imagine how it would affect you, and how it would affect other participants in your life. These diseases and illnesses don’t just happen, they happen to you and to your family — you do not get a choice. For2+ years, I’ve dealt with feeling bad, fatigue, night sweats, headaches, skin sores, joint pain, vomiting, stomach cramps, insomnia, and overall bowel issues. They’re the worst. On top of that is the stress and worry that comes with living with these issues every day. But to you, I’m just sick and expect something from the world. Think about the years this ‘young’ person has to look forward to. That’s why I’m bothered. I am afraid these issues will never get better. But to you, I’m just weak and disagreeable. But to you, I’m just scathing and negativistic. I have every right to be cross. I am afraid that nothing can be right within my body. I have every right to be bitter and concerned by my circumstances. I know it could be worse, but I have every right to worry about what’s next, and that’s what so scary about it. I have every right to dwell on my symptoms because that’s my life. But to you, I’m just angry-at-the-world and anxious. Like other sufferers, we can’t control it and we didn’t cause it. This struggle is what we get to look forward to for the rest of our lives. This struggle is what I get to look forward to for the rest of my life. So what if I’m bitter?? I might be. Check out Pinterest and Facebook for daily updates! Also on The Mighty, Huffington Post, HealthforHuman, and others. I can’t imagine what you go through each and every day. Fibro and endo are bad enough but at least I get a break from the symptoms sometimes. Ignore those that don’t get it (I know, so much easier said than done!). Praying you find some answers to at least relieve some of the symptoms very soon.